The beautiful landscape surrounding Berlin is well-wooded forests and carved out by the area is many lakes. On this special European cycling holiday, you can enjoy a refreshing swim followed by a relaxing picnic at the lakeside. At the same time, you can experience the historic cities of Potsdam and Berlin, where the present is as interesting as their history. Visit the world-famous buildings like the Brandenburg Gate and Sanssouci Palace. Your cycling holiday will take you through little villages with attractive brick Gothic structures, but you will experience the sites of darker days in Germany like the museum Sachsenhausen. This holiday tour is both beautiful and emotionally powerful. Individual arrival in Berlin till the late afternoon. You get your travel briefing and your bikes (if booked). Afterwards you have time to stroll through the capital. One overnight in Berlin. 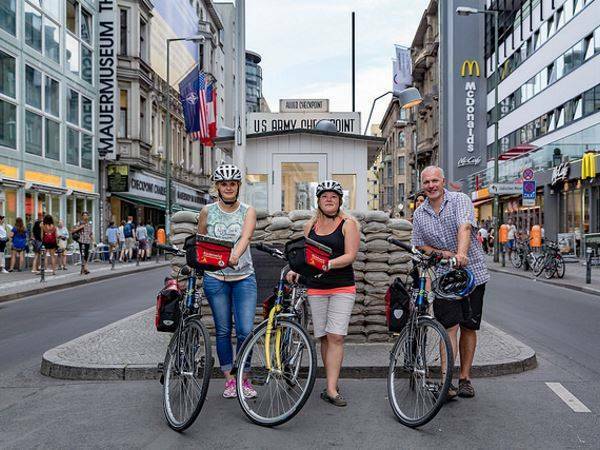 At first you cycle through the government district, pass the Brandenburg Gate and the Potsdam Square. You follow the course of the old military road (B1). At the botanic garden a stopover is worthwhile, before you reach your destination for the day: Potsdam. (approx. 40 km) One overnight in Potsdam. Impressed by the sights of Potsdam you cycle at first alongside the Havel to Werder with its beautiful, on an island located old town. Fruit-growing and lakes shape the landscape till you reach your destination of today: Brandenburg at the Havel. (ca. 55 km) One overnight in Brandenburg at the Havel. You leave the cathedral city Brandenburg in direction to the north and cycle alongside the extensive Lake Beetz. You drive along the Lake Beetz, to the neo-baroque castle Ribbeck. Continue to Groß Behnitz/ Nauen to your hotel “Landgut Stober”. (ca. 45 km) One overnight in Nauen or urroundings. You pass the charming old town Nauen. 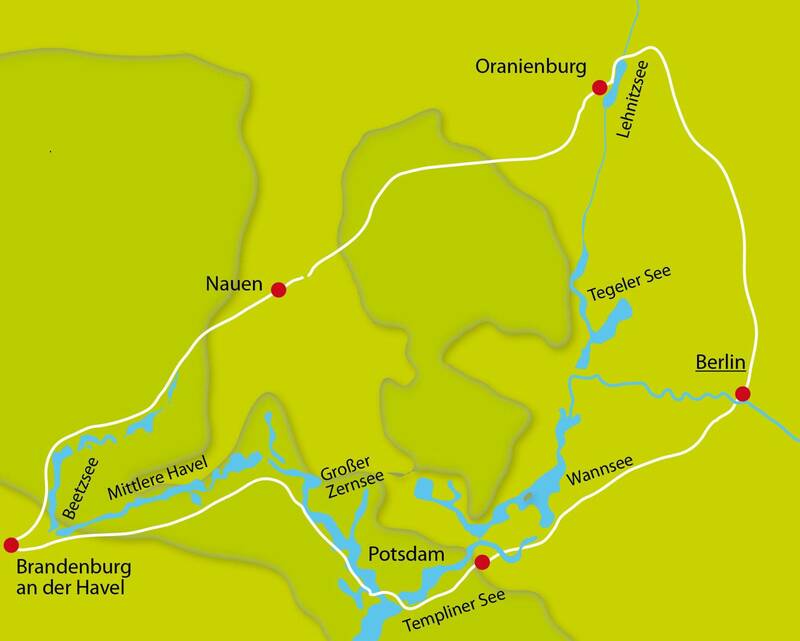 On your tour of today you cycle along the havel channels to Oranienburg. You reach it in the early afternoon, so that you have enough time to explore the town. You should absolutely visit the oldest baroque castle of the Mark of Brandenburg and the museum concentration camp Sachsenhausen. (ca. 60 km) One overnight in Oranienburg. You cycle via the Sachsenhausen Memorial and the former residential area of East German government. In Wandlitz you reach the bike path Berlin-Usedom, which leads you to the federal capital Berlin. (approx. 65 km) Two overnight in Berlin. Enjoy the day in Berlin. Second overnight in berlin. The tour ends after breakfast. Individual return journey. This Berlin Lakes by bike tour is easy to cycle. We avoid busy streets and instead we cycle on bike paths and side roads. Sometimes the roads could be unpaved. Routes on this Potsdam and Berlin tour may be subject to change or alteration. All route notes, maps and day-by-day information are provided to you upon arrival at the first hotel or the welcome meeting. 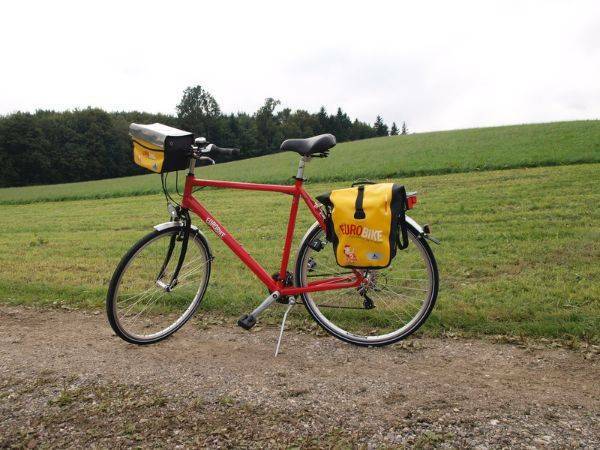 GPS/GPX files are available for most of our cycling holidays in Germany including our Bavarian cycling holidays. Please ask us for details. We recommend flying to Berlin region airports to reach the starting point of this cycling holiday in Berlin. Arrival by car: The Maritim proarte Hotel is located between the Brandenburg Gate and Gendarmenmarkt in the Friedrichstraße. The Friedrichstraße is a junction from the street "Unter den Linden“. The hotel is 1 km away from the main station. Berlin lakes Parking garage is about €16 per day. Arrival by train: Take the train to the main station Berlin. The hotel is about 1 km away from the railway station. Take the tram S5, S7 and S75 to the tram station "Friedrichstraße“. From here you can easy reach the hotel by foot. Arrival by plane: Take the Bus TXL from the aiport Berlin Tegel to the tram station "Unter den Linden/Friedrichstraße“. From the airport Berlin Schönefeld take the tram S9 to Ostkreuz and then S3, S5, S7, S75 or S+U to Friedrichstaße. Or drive directly by regional train from the airport via S+U Friedrichstraße. Flights are available with a number of airlines to your required airport or you can travel to the start of this bike tour around Berlin using alternative methods such as rail or road. 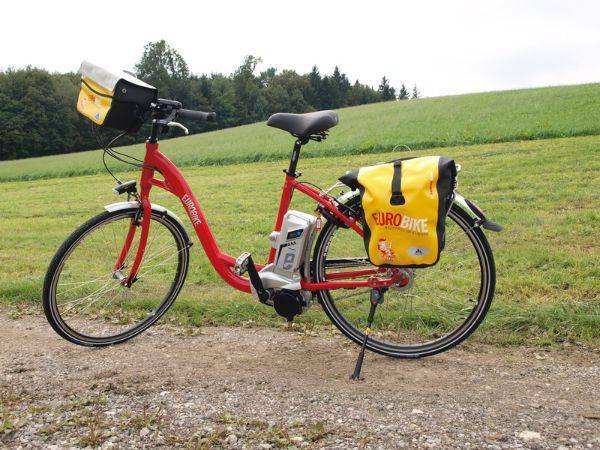 Please use local transport to arrive at the starting point of this Berlin Lakes by bike holiday or call us on 0800 755 5385 for more specific travel advice. You do not need to go back to the starting point of the cycling holiday in Berlin as all hire bikes are left at the final hotel. Important: Please book your flights only after this cycling holiday in Berlin has been confirmed by invoice or email. Flights and transfers are not included in the advertised holiday price. 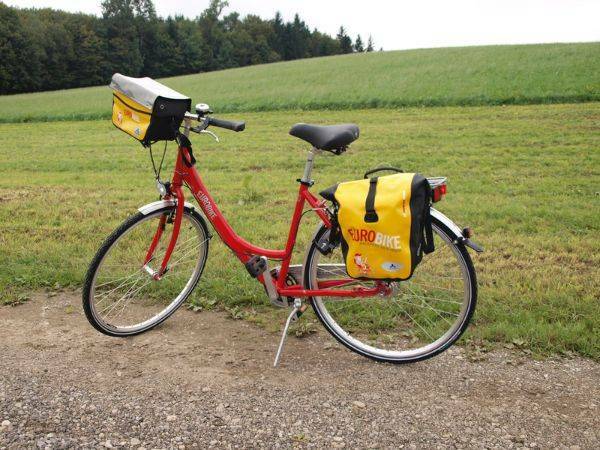 The Berlin Lakes cycling holiday includes the daily transfer of luggage to the next hotel and local support if required.